Photo courtesy of Erin Armknecht. 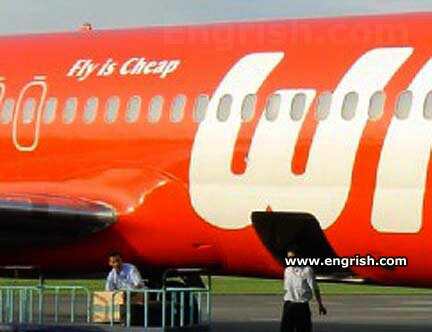 Pic of Wings Airline from Indonesia. Each ticket enters the lucky draw for a free funeral (guest numbers restricted to 5; byo food, alcohol & seating; first come first served; winning lucy draw does not mean you have actually won the lucky draw). Enjoy your fly! No frills, but plenty of thrills. Fly is cheap because fuel is half and maintenance is none. Life vests are expensive. The Spanish kind is expensive, though. I thought Bird was Cheap? Wings.. we be some air. To disembark, grab two beers and jump. Fly is cheap because the tourist seats are in the cargo hold, that cardboard box is your seat, oxygen is available at additional cost, and the toilet is in the corner. Flying is optional – Landing compulsory. Yu get all the fries you want on our airline. We use substandard parts and pass the savings on to you. Interesting… I actually sent in “Fly is cheap”, complete with “Wings” airline livery….on 23rd March 2010…..
Anyway… You want fries with that… that’s extra.. Fly is cheap, but bathroom cost you $100 American cash. In twenties. Fly into mountain is expensive. And the looks on the customers faces after realising that we don’t do all those important safety checks before takeoff? Come to Indonesia and try this famous Indonesian delicacy on the plane before you land! – Side dish of Locust soup and crumbed ant crouton also available. It’s the chicks that are cheap. Their mothers are cluck. But what about the pants? I hope they pay their mechanics more than they pay their translators! @Buzz Killington: the slogan on the web site you linked is “We make people fly” — I visualize people being dragged onto the plane kicking and screaming. We spent all the money on orange paint.